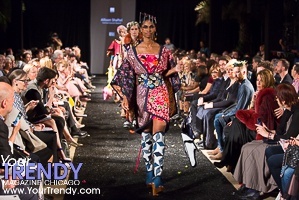 The School of the Art Institute of Chicago (SAIC), transformed Garfield Park Conservatory from flora to fashion in the first exhibition of its kind showcasing the work of the School’s internationally renowned Fashion Design students. The exhibition was free and open to the public. Attendees enjoyed a front-row look into the world of avant-garde fashion, as they got up close to the embellishments, embroidery and expertly crafted fashion designs that were exhibited throughout the gardens. 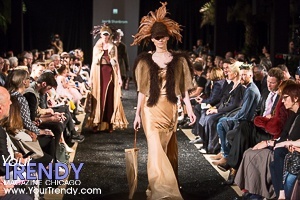 For more than 80 years, SAIC’s Fashion Design department has publicly showcased its students’ collections each spring. Evolving from concept to creation in just two semesters, 230 innovative looks pushing the traditional boundaries of style were on display, created by 96 sophomores, juniors and seniors. SAIC’s Fashion Design program boasts distinguished alumni, including Halston, Cynthia Rowley, Maria Pinto, Gary Graham and Creatures of the Wind. This year’s concept, Reflexion, is inspired by the Garfield Park Conservatory’s beautiful botanical setting, and seeks to evoke a personal and global reflection about both concept and material use. Among other themes, Reflexion explored the future of fashion in a sustainable world. SAIC’s Fashion exhibition took place throughout the Garfield Park Conservatory’s lush gardens, 300 North Central Park Avenue. As part of the exhibition, SAIC hosted a runway show for invited guests to see work from senior students in a professionally produced fashion event. During the runway show, the RumChata Foundation presented Benjamin Larose with a $20,000 fellowship to continue his fashion design work beyond his graduate studies at SAIC. This was the first ever post-graduate fellowship presented by the department, and in the spirit of the RumChata Foundation celebrated the passion and drive it takes to create and bring to life an idea that started from one’s imagination and vision.